"The chief minister is no more," federal home ministry spokesman tells CNN. NEW DELHI, India (CNN) -- An elected head of a south Indian state and four others died in a helicopter crash, federal authorities said Thursday. Chief Minister of Andhra Pradesh Y.S.R. 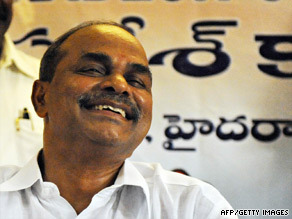 Reddy smiles at the Congress party office in Hyderabad on May 16. The chopper carrying Y.S.R. Reddy, chief minister of Andhra Pradesh, went off radar while flying over the state Wednesday morning, according to India's civil aviation ministry. "The chief minister is no more," Onkar Kedia, spokesman for the federal home ministry, told CNN. Also onboard were Reddy's principal secretary and chief security officer as well as two pilots, CNN/IBN reported. Authorities found the wreckage of the helicopter in a large search involving ground and air operations. The twin-engine Bell 430 went missing after it took off from Begumpet Airport in Hyderabad city and headed to Chittoor district, both in Andhra Pradesh. "The chief minister was a strong supporter of U.S.-India friendship and our bilateral partnership, visible in the strong economic and family ties between the people of Andhra Pradesh and the United States," U.S. Ambassador Timothy J. Roemer said in a statement in New Delhi. On behalf of the U.S. government, he expressed his condolences to Reddy's family, as well as to the families of those who died along with the chief minister.